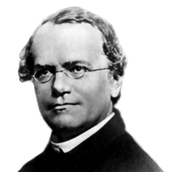 This is a list of Catholic churchmen throughout history who have made contributions to science. 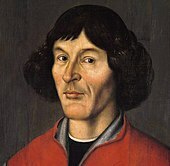 These churchmen-scientists include Nicolaus Copernicus, Gregor Mendel, Georges Lemaître, Albertus Magnus, Roger Bacon, Pierre Gassendi, Roger Joseph Boscovich, Marin Mersenne, Bernard Bolzano, Francesco Maria Grimaldi, Nicole Oresme, Jean Buridan, Robert Grosseteste, Christopher Clavius, Nicolas Steno, Athanasius Kircher, Giovanni Battista Riccioli, William of Ockham, and others listed below. The Catholic Church has also produced many lay scientists and mathematicians. The Jesuits in particular have made numerous significant contributions to the development of science. For example, the Jesuits have dedicated significant study to earthquakes, and seismology has been described as "the Jesuit science." The Jesuits have been described as "the single most important contributor to experimental physics in the seventeenth century." According to Jonathan Wright in his book God's Soldiers, by the eighteenth century the Jesuits had "contributed to the development of pendulum clocks, pantographs, barometers, reflecting telescopes and microscopes, to scientific fields as various as magnetism, optics and electricity. They observed, in some cases before anyone else, the colored bands on Jupiter’s surface, the Andromeda nebula and Saturn’s rings. They theorized about the circulation of the blood (independently of Harvey), the theoretical possibility of flight, the way the moon effected the tides, and the wave-like nature of light." 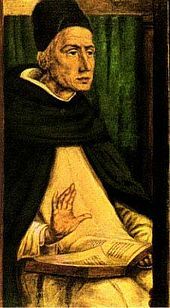 Albertus Magnus (c. 1206–1280) – Dominican friar and Bishop of Regensburg who has been described as "one of the most famous precursors of modern science in the High Middle Ages." 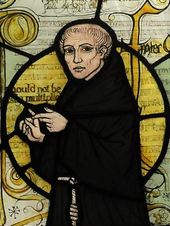 Patron saint of natural sciences; Works in physics, logic, metaphysics, biology, and psychology. Giulio Alenio (1582–1649) – Jesuit theologian, astronomer and mathematician; was sent to the Far East as a missionary and adopted a Chinese name and customs; wrote 25 books, including a cosmography and a Life of Jesus in Chinese. Stefano degli Angeli (1623–1697) – Jesuate (not to be confused with Jesuit), philosopher and mathematician, known for his work on the precursors of infinitesimal calculus. Paolo Casati (1617–1707) – Jesuit mathematician who wrote on astronomy, meteorology, and vacuums; the crater Casatus on the Moon is named after him; published Terra machinis mota (1658), a dialogue between Galileo, Paul Guldin and father Marin Mersenne on cosmology, geography, astronomy and geodesy, giving a positive image of Galileo 25 years after his conviction. James Curley (astronomer) (1796–1889) – Jesuit, first director of Georgetown Observatory and determined the latitude and longitude of Washington, D.C.
Johann Dzierzon (1811–1906) – priest and pioneering apiarist who discovered the phenomenon of parthenogenesis among bees, and designed the first successful movable-frame beehive; has been described as the "father of modern apiculture"
Gilles-François de Gottignies (1630–1689) - Belgian Jesuit mathematician and astronomer. Christoph Grienberger (1561–1636) – Jesuit astronomer after whom the crater Gruemberger on the Moon is named; verified Galileo's discovery of Jupiter's moons. Robert Grosseteste (c. 1175–1253) – bishop who was one of the most knowledgeable men of the Middle Ages; has been called "the first man ever to write down a complete set of steps for performing a scientific experiment"
Dámaso Antonio Larrañaga (1771–1848) – Uruguayan priest, naturalist and botanist who made important contributions to these scientific disciplines. He was a decisive influence behind the foundation of the National Library of Uruguay and the National University of Uruguay. His face appears on the 2000 Uruguayan peso banknotes. Marin Mersenne (1588–1648) – Minim philosopher, mathematician, and music theorist, so-called "father of acoustics"
Luca Pacioli (c. 1446–1517) – Franciscan friar who published several works on mathematics; often regarded as the "father of accounting"
Léon Abel Provancher (1820–1892) – priest and naturalist devoted to the study and description of the fauna and flora of Canada; his pioneer work won for him the appellation of the "father of natural history in Canada"
Giovanni Battista Riccioli (1598–1671) – Jesuit astronomer who authored Almagestum novum, an influential encyclopedia of astronomy; the first person to measure the rate of acceleration of a freely falling body; created a selenograph with Father Grimaldi that now adorns the entrance at the National Air and Space Museum in Washington, D.C.; first to note that Mizar was a "double star"
Thomas Zebrowski (1714-1758) – Jesuit architect, mathematician, and astronomer; instrumental in establishing and funding the Observatory of Vilnius University. ^ Susan Elizabeth Hough, Richter's Scale: Measure of an Earthquake, Measure of a Man, Princeton University Press, 2007, ISBN 0691128073, p. 68. ^ "Kish, George. "Acosta, José De". Complete Dictionary of Scientific Biography. Detroit: Scribners, 2008. ^ "CATHOLIC ENCYCLOPEDIA: Albert of Saxony". www.newadvent.org. ^ a b Woods 2005, p. 96. ^ "Francesco Castracane degli Antelminelli - Encyclopedia Volume - Catholic Encyclopedia - Catholic Online". Catholic.org. Retrieved 2018-04-15. ^ Hockey, Thomas A. (1 January 1998). "Galileo's Planet: Observing Jupiter Before Photography". CRC Press – via Google Books. ^ Chisholm, Hugh (15 April 2018). 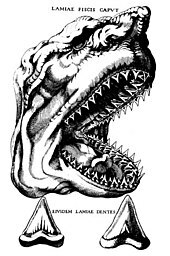 "The Encyclopædia Britannica: A Dictionary of Arts, Sciences, Literature and General Information". At the University Press – via Google Books. ^ "Ruggero Giuseppe Boscovich - Italian astronomer and mathematician". ^ Kneller, Karl Alois (15 April 2018). "Christianity and the Leaders of Modern Science: A Contribution to the History of Culture in the Nineteenth Century". B. Herder – via Google Books. ^ Woods 2005, p. 95. ^ Woods 2005, p. 4. ^ Woods 2005, p. 36. ^ "ADOM :: Father Hurricane: a genius of meteorology". www.miamiarch.org. ^ "CATHOLIC ENCYCLOPEDIA: Francesco Zantedeschi". www.newadvent.org. 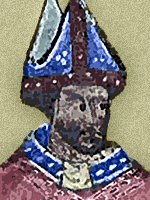 ^ King, Henry C. (15 April 2018). "The History of the Telescope". Courier Corporation – via Google Books. Heilbron, J. L. (1999). The Sun in the Church: Cathedrals as Solar Observatories. Cambridge: Harvard University Press. Lindberg, David C.; Numbers, Ronald L., eds. (1986). God and Nature: Historical Essays on the Encounter Between Christianity and Science. Berkeley: University of California Press. Walsh, James J. (2007). Catholic Churchmen in Science: Sketches of the Lives of Catholic Ecclesiastics Who Were among the Great Founders in Science. Kessinger. ISBN 978-0-548-53218-8. Wright, Jonathan (2004). God's Soldiers: Adventure, Politics, intrigue and Power: A History of the Jesuits. London: HarperCollins. Barr, Stephen M. Modern Physics and Ancient Faith. Notre Dame, IN: University of Notre Dame, 2006. Broad, William J. "How the Church aided 'Heretical' Astronomy," New York Times, October 19, 1999. Feingold, Mordechai, ed. Jesuit Science and the Republic of Letters. Cambridge: MIT Press, 2002. Gilson, Etienne, Reason and Revelation in the Middle Ages. New York: Charles Scribner's Sons, 1970. Grant, Edward. 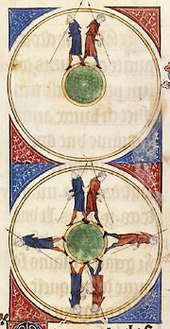 The Foundations of Modern Science in the Middle Ages: Their Religious, Institutional, and Intellectual Contexts. Cambridge: Cambridge University Press, 1996. Grant, Edward. God and Reason in the Middle Ages. Cambridge: Cambridge University Press, 2001. Hannam, James. The Genesis of Science: How the Christian Middle Ages Launched the Scientific Revolution. Washington, DC: Regnery, 2011. Horn, Stephan Otto, ed. Creation and Evolution: A Conference with Pope Benedict XVI in Castel Gandolfo. San Francisco, CA: Ignatius, 2008. Jaki, Stanley. The Savior of Science. Grand Rapids: Eerdmans, 2000. Jaki, Stanley. Science and Creation: From Eternal Cycles to an Oscillating University. Edinburgh: Scottish Academic Press, 1986. MacDonnell, Joseph E. Jesuit Geometers. St. Louis: Institute of Jesuit Sources, 1989. 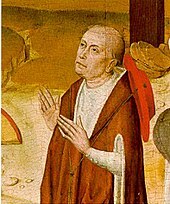 Schönborn, Christoph Cardinal. Chance or Purpose? : Creation, Evolution, and a Rational Faith. San Francisco: Ignatius, 2007. Spitzer, Robert J. New Proofs for the Existence of God: Contributions of Contemporary Physics and Philosophy. Grand Rapids: Wm. B. Eerdmans Publishing Company, 2010. Walsh, James J. The Popes and Science. New York: Fordham University Press, 1911.